I hope you are having a wonderful holiday weekend! 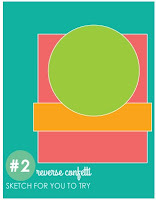 Lately I have been drawn to super bright colors and that is how my card started today. I wanted to use my Reverse Confetti stamps again and also their second Sketch For You to Try. This time I combined two separate sets - Happy Harbor and Dream in Color. I used papers from the My Mind's Eye Summer Splash 6" paper pad. to make my card. For my banner, I used my much neglected Memento markers to color in each little anchor and then stamp the line all at once. It took two tries, but I finally nailed it. 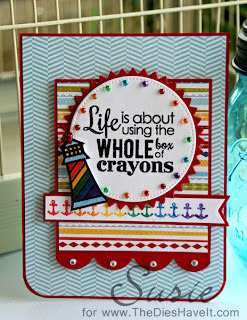 I used the same markers to color in the lighthouse which had been heat embossed and cut out. Putting the card together was a snap since I already had the sketch. There is still time for you to play along too. Click right here for the information and the link. By the way, they are about to have a brand new release, so be sure to check out the blog at Reverse Confetti. Now here is the sketch for YOU to try. See you tomorrow with a fun challenge card. Beautiful. Love the sentiment. I will have to borrow it sometime. Super cute. Love the light house in the rainbow colors. Susie, I really like your brightly colored card. 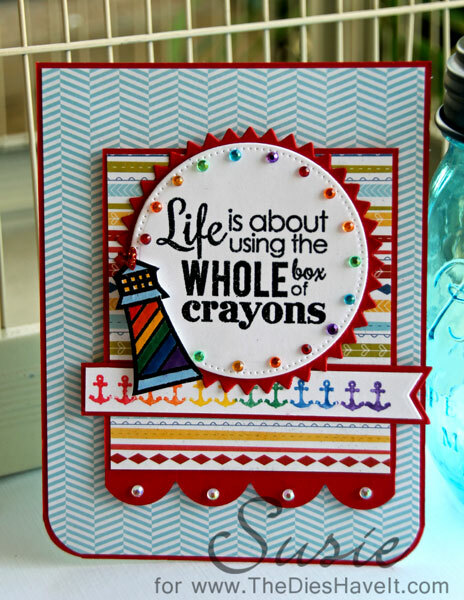 The colorful anchors are great. Hugs!